This week I met with our co-Founder Miriam Avraham and our graphic designer to discuss the format of the new Shutaf brochure. We had a wonderful meeting and have developed some great ideas. However, as anyone with experience in PR and marketing will know, conversations such as this not only address what will be included in the brochure, but also – and perhaps more importantly – how they will be included. Which photos to include? What font will we use? And there is no doubt that all of these questions are important, especially when seeking to attract further donors to support Shutaf’s programs. However, soon after the meeting I was struck by a disturbing thought. I realised that so much of our conversation about the brochure was about first impressions, and yet so much about the mission of Shutaf is to see beyond first impressions and realise that every child, with or without disabilities, is unique and can make unique contributions to the world. By focussing on image, I realised that we were compounding the very message that Shutaf seeks to redress! 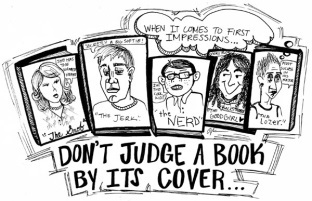 So here’s the conundrum – how do we judge beyond first-impressions? To begin with, we must admit that we do judge by first-impressions. This may sound easy; but as the following study found in Malcolm Gladwell’s book ‘Blink’ proves, MANY people judge books by covers. However, in recent years, significant changes have taken place in how musicians are hired. These included identifying the musicians not by name but by number, and placing screens between the music directors and the auditioner. “[and] as these new rules were put in place.. an extraordinary thing happened: orchestras began to hire women”. So how can we learn to judge beyond first-impressions when we are all hardwired to judge by first-impressions? The answer to this conundrum is ‘inclusion’. If we proactively get to know people different to us, then we are proactively challenging our natural status quo to judge by first-impressions only. Put differently, inclusion is the only way to overwrite our first-impression of difference with something more meaningful. So is an image-driven Shutaf brochure an oxymoron? I don’t think so – because it is only by promoting inclusion programs that we can teach ourselves to look at the world differently. Until then, we’ll make sure that the Shutaf brochure has a great cover!